Halloween decorating has begun here at Love and Life at Leadora. I am hosting October BUNCO, so I am forcing myself to get my decorating groove on. My corner cabinet in the dining room is always the easiest spot to start. Plus, it's a great place to showcase my favorite and easiest Halloween decorations: black construction paper silhouettes! I must give thanks to Martha Stewart for this idea, especially since I found all the templates for the mice and owl on her website. So if you're having trouble like me getting into Halloween decorating, go visit Martha. Just bring along your black paper, scissors and tape! Wow!!! That cabinet is great for Halloween decor. I will check out Martha's mice and owls. this is just such a happy halloween corner. the colors are rich and jumping right out of the picture! love it!! I look forward to see what your do with your corner cabinet.. and you out did yourself again. It looks fantastic. I used to always host the Halloween Bunco too.. I think that is what got me started with the decorating craze. Glad you're back! Your cabinet looks fabulous as usual! Love it all! Bunco, how fun! We haven't had a group in ages, it was a lot of fun, I usually did Christmas, that was some pressure! Darling corner cabinet. I love all your special details. Those black mice are simply adorable. I think I need to cut out some black mice and pose our two kitties near them. Your cabinet looks amazing Heather! Halloween is such a great time for silhouettes. The just work so perfectly. Love it. That is really cute! I needed some inspiration today. All of my neighbors have their porches decked out for fall. I think I'm the only one on the block who hasn't pulled anything out yet. sigh..
You always do such cute and wonderfully special decorating in your corner cabinet. Yes, Martha does inspire...After seeing her website last weekend, that put me in the mood to get started on mine, too. Very cute! Love it!! I have the mice cut-outs too! Heather that looks ADORABLE! I have to try that - I think it is a craft I could actually handle!! LOL! And those boots are so cute! Enjoy the rest of your weekend! I visited your blog today - I saw you on 'White Torquoise Chocolate.' Your photos are so unique and pretty. I love the Halloween corner cabinet. Me and my daughters started a new blog, and we would love it if you could visit us and follow. I would enjoy coming backa to visit with you and seeing all your creative ideas. I hope to hear from you, and have a fun Fall weekend. I shall try to cut some mice this year as well:) Here in Finland we have borrowed your idea of Halloween even if we have an own traditional celebration a bit like that, too. In my family we like to mix these two and the children love it. This year we even have some pumpkins! 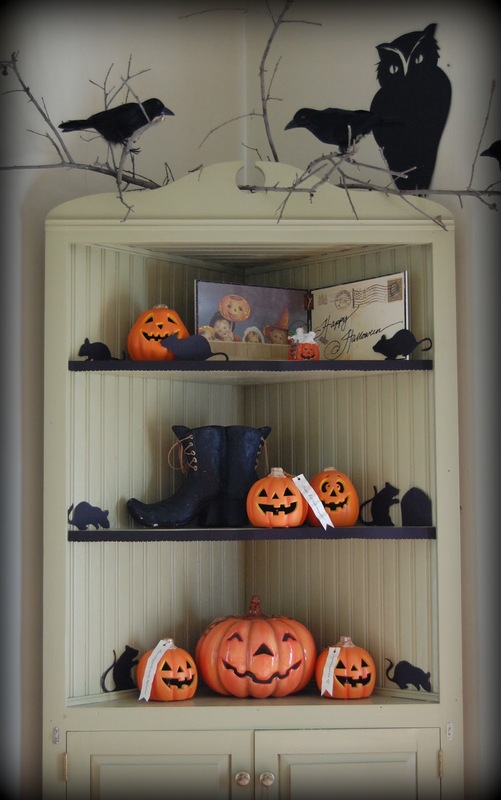 I always love what you do to your corner cabinet...and I always look forward to it too :-) I haven't put up any Halloween decorations yet so I think I'll have to go over to Martha's for some inspiration and motivation...Hee,hee, hee. Have a wonderful day.